* Measures approx. 14-1/2" x 8-1/4" x 18-1/2"
The rubber gasket seal provides dirt and moisture protection, keeping you possessions dry and safe. 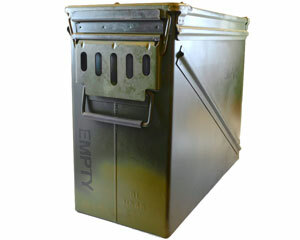 Ammo cans are indispensable for easy and convenient storage at home or in the garage. But it doesn't end there; you can take them with you in the car or to the job site. Their heavy duty construction makes them ideal for storing tools, first-aid supplies, tow-chains, and of course ammunition. Tried and true! These genuine U.S. Government ammunition cans are in good condition. Yet, a little elbow grease will go a long way to make these boxes look like new. Markings and color vary by box and some may not have markings at all. Smith & Edwards surplus items are in various conditions. If you have a special need, such as rust-free interior, no dents on sides, etc, please enter a note at checkout or call 801-731-1120 before placing your order (mention "online ordering") and we will do our best to accommodate you. All ammo cans have some rust on the exterior. Thanks for understanding! Disclaimer: Although, Smith and Edwards Co. strives to provide quality products the condition of this product may vary and is used. As such no warranty expressed or implied is given.